Which Long Pips Rubber ? Quote Reply Topic: Which Long Pips Rubber ? I'm thinking of switching to a Long Pips Rubber. Thought I'll do some research, but now, that has confused me even more... So many parameters, and to make things more confusing, so my sponge thicknesses.. Cannot move my feet as quickly as I could. .. I'm still working on this.I want to control the pace of the point. My BH loop, drive, and top-spin technique is not on par. I genuinely tried .. even improved a bit, but now with the elbow injury has set my back, infact, made things worse. My level is beginner - intermediate, but I would be new to long pips.. I require Control, Control and then some more ... I want to be able to place the ball wherever, at whatever pace.. I prefer over-the-table/close-to-table, pushing, chopping, with Heavy Spin.. So a LP rubber that can generate a decent amount of it's own Spin. My game is primarily push/chop on the BH, and Loop/Topspin on the FH. On the BH, I also Drive the ball, when the opportunity presents itself. I typically dead-block top-spins to my BH .. But, if I happen to be away, I'll also chop back. Would prefer Medium Spin-Reversal .. I understand that both, Spin and Spin reversal is not possible with the same rubber. Low-Medium Deception... It would only be a bonus. I'm a tad cost sensitive..
Dawei OX 388d-1 soft with good control and versatility. Thanks LuckyLOOP.... I'll surely check it out ... Is your recommendation based on your own experience with it ? If you want control, I would recommend CTT National Pogo or Friendship 755.. Both are high control rubbers, ideal for anyone starting to play with long pips.. I have tried over 30 different long pips and Pogo has the best control. It's not very funky and does not bother opponents like other rubbers but it is a perfect rubber for control and to learn to play with long pip.. It does everything well but nothing great.. In my opinion, Pogo is the best allround long pips rubber. I would recommend OX unless you plan on chopping far away from the table.. I've heard of Dawei, but this is first I'm hearing of CTT or Pogo.. Anyway, I did some reading-up on it, and it seems to have very good control ...and has received mostly positive reviews..
Palio ck531a is also a good candidate and cheap. Although not a LP, Dr Neubauer Nugget might do the job you want it to. The recent review by TT-Maximum showed it to be very versatile with its stand out feature being bucket loads of control. Close to the table means you have to go into it planning to block and hit some. Chopping is essentially out. Pushblocking and dead blocking are in. Almost any of the prior mentioned rubbers can work for you. Probably the best thing you can do is get one (preferably a cheap one), go OX and stick with it. The LP EJ junkie journey can be very, very, very long with little benefit. Gambler Hinoki Vector blade; Double inverted. Or some LPs. Work on your long pips fundamentals, then later you can pick a long pips that closely fits your desired playing style. Watch videos of the Pushblocker is a good place to learn. To start-off with LPs, I'm thinking of getting one that's cheap. Perhaps, one of the Chinese ones.. From all the above recommendations, the Dawei 388D-1 seems like an option. I'm also wondering about ones like Giant Dragon Crop Circles, and Spinlord Donenglanz (A tad more expensive)..
Also, my current Blade is a 23+year old Butterfly Joyner -H AN (OFF) ply... This the "Made in Japan" one, with the Metal tag on the handle. If I am to switch to a LP, shall I stick with this ply or switch to another one, for best LP effect ..
Dawei 388D-1 is the most popular LP rubber used in China. One of our club's top players uses that, he is a 2300+ player. I use the same LP, 388D-1, but I am 600 rating points below him. Dawei 388D-1 is very cheap. It is not the rubber, it is the skill that counts. I'm also wondering about ones like Giant Dragon Crop Circles, and Spinlord Donenglanz (A tad more expensive).. Both good rubbers, but too advanced for you. I would go with a defensive blade or an all around inexpensive one. Anyway, as for the blade, which one would you recommend ? You can't use it in sanctioned events anymore.. It's coming off the authorized rubbers list.. I have used it on my Dr. Neubauer Firewall Plus blade.. I have also used it on the HALLMARK Aurora blade on the slower side. I do like it better on the Firewall Plus blade. I feel that it has more control on the Firewall Plus blade.. I have only played the OX version, so I can't comment on the sponged versions of Pogo.. There are some vendors (online), selling Yinhe Long Pips - namely, Neptune & Quing ..
Tabletennis11.com ships worldwide and and least to the US, they ship fairly cheap.. They do have the Firewall Plus blade.. I don't think you have to switch to LP just yet. You're better off switching to Reflectoid 1.5mm. Search videos on youtube and you will see effective close to the table blocking with some attacks mixed in. You can win a couple of points per game too with the "brake effect". Fun stuff! Also, you need to consider a certain mentality that comes with being a LP player whether it's how you want to win or how you react to various b.s. that LP players have to deal with. More than anything, I admire their ability to brush rude players off. Most would get in a fight if subject to these situations LOL! Not sure how much they charge for shipping.. I believe that price is in Australian Dollar, not US Dollar.. Unfortunately, they only have 0.6mm and not OX..
Dandoy has it in OX. Pushblocker - Where do you get your Giant Dragon Talon? if not, you can try talnet, 338D, 338D-1, 755. Personally, I don't like Neptune or Quing. I play close table. There is a place in Malaysia that also has it but their payment processing company can't process US credit cards..
Ahhhhh..... I thought it was me, or my Visa which is Belgian. Pity cause they offer a lot of quality stuff for decent price. I was there last year and was impressed by the people especially the owner. Lovely folks. One question remains open: shall the Belgian customs ask me to pay import taxes like they always do when I buy from Japan? So, I'm still not sure what blade to buy ... Does it make send to just stick a LP on my existing Joyner ? 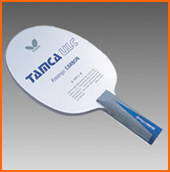 Has anyone used any of the following blades, and if YES, whats your take on it..
MyTableTennis.NET is the trading name of Alex Table Tennis Ltd. Copyright ©2003-2019 Alex Table Tennis Ltd. All rights reserved.